I recently clicked on a link to a site that was offering to supply 100 minutes of free long distance calling for your cell phone. The program is called ‘VoiceItAll’ and is put out by Canadian Tire. You can view the site at: VoiceItAll. The program sounded a bit interesting for any of us who only use their cell once in awhile for long distance calling. So I looked around at the site a bit more. Eventually I found a link to check for local access numbers that you have to call first before you get your free long distance calling. The page for the access numbers is found at: Voice To Text. A quick click on the link takes you to Dial In Numbers. Once you choose your country (in my case Canada) and then you have a list of local access numbers for the provinces in Canada. As I scrolled down the page I came to ‘Regina, AB’. The number actually looks like a Regina, SK number as it is prefixed with the area code of ‘306’ and the ‘564’ is a Regina, SK local number. I did take a picture of the page just to make sure I wasn’t seeing things. I wasn’t aware that Saskatchewan has now become part of Alberta! Those darn politicians, what else are they not telling us? Seriously, you would think a company as large as Canadian Tire would actually know what province Regina is in. 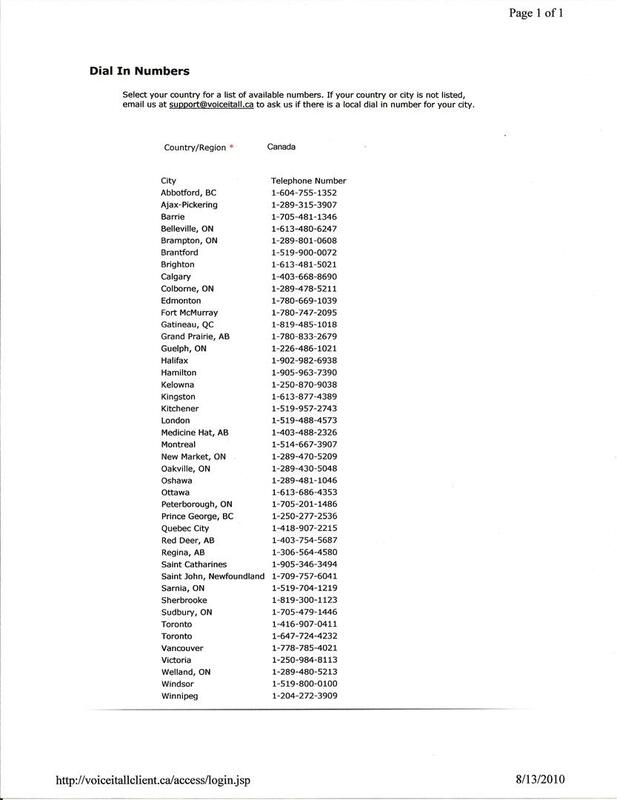 As a side note, to use this service you need to call the local access number which in my case would be Regina, AB. Even if it was where it should actually be, ie Regina, SK; it would be still a long distance call for me. So I would have to call long distance to get a long distance saving plan. Something doesn’t seem right about this thought…. Oh well, I keep looking and surfing around.